The Democratic dam is already starting to break for the Obama administration when it comes to the allegations of misconduct at VA hospitals around the country. On Thursday afternoon, Democrat Alison Grimes -- who is challenging Mitch McConnell in Kentucky’s competitive Senate contest -- called on VA Secretary Eric Shinseki to resign. "We owe a solemn obligation to our veterans, and our government defaulted on that contract. I don't see how that breach of trust with our veterans can be repaired if the current leadership stays in place," she said in a statement. (Not a bad way to distance yourself from the Obama administration, huh?) Florida Sen. Bill Nelson stopped short of demanding Shinseki’s resignation, but came very close. “Some heads need to roll,” he said. And while not a Democrat, Bob Dole (a disabled veteran, an advocate for veterans, and someone who has helped the Obama administration on the U.N. disabilities treaty), told USA Today that the VA needs a shakeup. 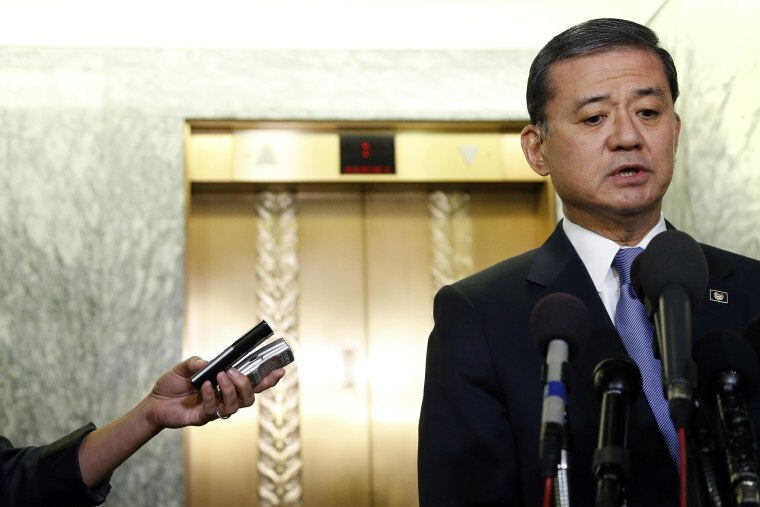 "[Shinseki] should stay until the White House gets this investigative report that they're doing, until we get the facts, and you see what you can lay at his feet and what his response has been,” said Dole, who introduced Shinseki at his 2009 Senate confirmation hearing. But he added, "If the facts reveal that he neglected his duties, then he should go." And now comes the Memorial Day weekend, with lots of politicians holding events with veterans, which will probably put even more pressure on Democrats -- especially those from red and purple states -- to speak out. For the Obama White House, it’s bad timing to be dealing with this VA mess. With the Memorial Day weekend approaching, Shinseki penned a letter to veterans addressing the allegations, per NBC’s Katie Wall. “Allegations of VA employees' misconduct have surfaced over the last several weeks, beginning with scheduling delays at the Phoenix VA Health Care System. As I testified before Congress on May 15, I take any allegations about patient safety or employee misconduct very seriously. The reports of Veterans' negative experiences while seeking VA care are of great personal concern to me,” he wrote. “As we approach our observance of Memorial Day and its special significance to our Nation, VA is re-doubling its efforts, with integrity and compassion, to earn your trust. As President Obama said, Veterans have ‘done their duty, and they ask nothing more than that this country does ours-that we uphold our sacred trust to all who have served.’ And, we will.” Shinseki is TRYING to dig in. The administration still believes that when the investigation into the VA is done that the allegations will be more isolated than wide spread, but the damage to Shinseki and the leadership at the VA may be hard to undo. Will veterans groups be willing to give him another chance? Doesn’t seem likely right now. In other news for the administration, NBC’s Stacey Klein reports that President Obama today will formally announce 1) tapping HUD Secretary Shaun Donovan to be his next OMB director, and 2) replacing Donovan at HUD with San Antonio Mayor Julian Castro. The announcement will take place around 3:35 pm ET. That eyebrow-raising story out of Mississippi isn’t going away -- and it promises to be THE issue less than two weeks before the Cochran-vs.-McDaniel GOP Senate primary. The Clarion-Ledger: “Authorities say the vice chairman of the Mississippi Tea Party and two other men conspired with Clayton Kelly to photograph U.S. Sen. Thad Cochran's bedridden wife in her nursing home and create a political video against Cochran.” The paper also connects the dots to what these three men have either to the Tea Party or to the McDaniel campaign. “Mark Mayfield is an attorney, Madison County Republican Party leader and officer in multiple tea party organizations. Richard Sager is an elementary school physical education teacher and high school soccer coach. And John Mary is a political activist who once co-hosted The Right Side Radio Show with Jack Fairchilds — and occasionally with Chris McDaniel.” More from the paper: “The McDaniel campaign has continually denied any involvement with the alleged illegal photographing of Cochran by 28-year-old Pearl blogger Clayton Kelly. While all three men arrested Thursday are McDaniel supporters, none of them have any official role with the campaign.” But McDaniel’s problem now is that the coverage down in Mississippi certainly creates the illusion of a connection. By the way, given the direction this race was headed, one has to ask themselves why these McDaniel supporters thought they needed to do this. Now, this story has given Cochran new political life. Have a happy and safe Memorial Day weekend. Our morning note will be back first thing Tuesday morning.